The Cadre Law Firm provides legal services in New York and New Jersey, specializing in commercial and residential real estate law and bankruptcy law. We are located minutes away from the George Washington Bridge making it convenient to provide services in New York and New Jersey. The firm is capable of handling all of your legal needs. Jill Cadre, Esq. 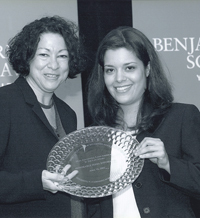 with the Honorable Sonia M. Sotomayor, Supreme Court Justice of the United States, presenting the “Most Influential Latina in the Law Award” in 2002. The Cadre Law Firm, a boutique law firm engaged in general practice, providing each client with the personalized attention to obtain the best resolution to the client’s legal needs. The Firm’s real estate department renders expertise in all aspects of real estate transactions, including distressed properties (loan modifications and foreclosures), short sales, residential, commercial and condominiums and cooperative units in New York and New Jersey. This “all needs” law firm prosecutes and defends a wide range of civil and criminal litigation in State and municipal courts in New York and New Jersey. "A rare attorney with a combination of brains, humanity and legal acumen. The kind of person you want as a friend and to represent you legally. I have never left her feeling worse than when I first came in. She has a warmth that is reassuring and at the same time Jill is powerful."